Not only does the new web app offer a better user experience, but it also provides more frequent bug fixes and updates without having to download a new version. The update process is simpler for our developers and transparent to you. It allows us to more easily implement new features and ensures it will be a useful tool for years to come. 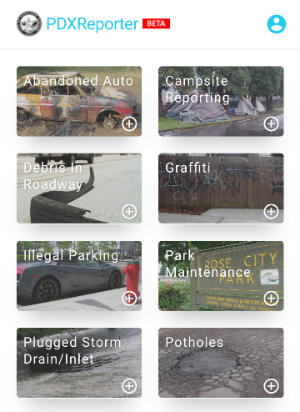 To use the new app, visit http://www.pdxreporter.org and log in using your PortlandOregon.gov account, or the account you used with the previous version of the app. Login is required, but registration is free and open to the public–just use the “sign up” link on the login page. If you save the app to your home screen, you can use it just like any other app on your smartphone or tablet. See the in-app help page for more information. For questions or more information call the Bureau of Technology Services at 503-823-5199.